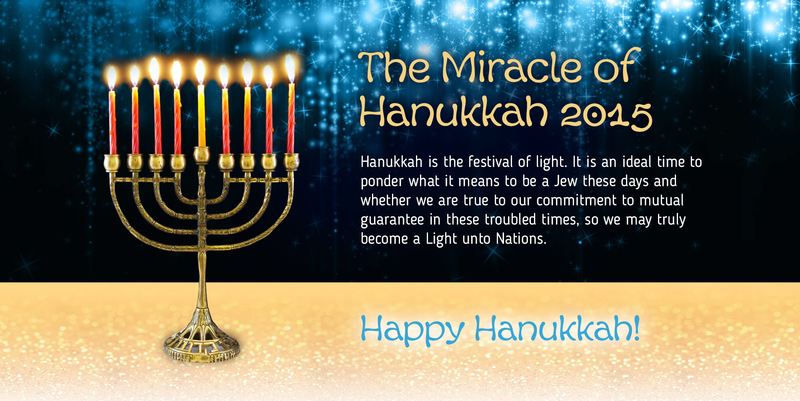 • What's a Hanukkah miracle in today's society? 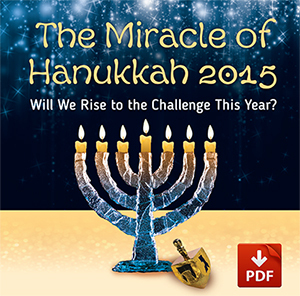 • How to start being a “light for the nations” this Hanukkah! Will We Rise to the Challenge This Year? A miracle, by definition, is something that according to the laws of nature as we know them isn’t supposed to happen. That is, if we discover new laws, perhaps what seems miraculous today will seem natural tomorrow. The world as we know it operates according to a very simple law: the stronger one wins and the weaker one loses. On all levels of nature, balance is kept by the fact that the stronger ones take only what they need for their sustenance. But on the human level, people take what they want in order to satisfy their need for superiority. The result is an unchecked war among people, fear, alienation, exploitation of people and the environment, and if we don’t stop, the eventual collapse of human society and the entire ecosystem that supports it. We already know that life on Earth would not have evolved had it not cultivated balance and harmony among the elements that comprise its ecosystems. Despite our awareness of this fact, we somehow fail to implement this balance on ourselves. Although we know we aren’t, we act as though we’re not subject to the laws of nature. We are behaving as if we may take what we want simply because we can. And we not only treat nature this way; this is also how we treat each other. So a miracle today would be if we could work not in favor of ourselves, but in favor, or at least in balance with the society we live in. This is where we, Jews, come into the picture. I’d like to suggest a fresh viewpoint on the war between the Maccabees and the Greeks. The real miracle of the Maccabees was not that a tiny tin inexplicably contained enough oil to light the menorah for eight days, but that the Maccabees were able to find the strength to unite and fight off the Hellenistic culture of self-indulgence. Today it seems like the Greeks have won—we’re all hedonistic to the core. But are we happy? It seems that the element of unity and social cohesion is the missing ingredient that could brighten up our lives. That is, we have enough to live on, but not enough to live for. Because if we’re only living for ourselves, then who do we share it with? And then, our hedonistic victory seems more like a Pyrrhic victory. Prior to the ruin of the Temple, the Jews had the gift of mutual guarantee and unity. That unity sustained us and enabled us to keep strong. Once we lost it, we lost the land of Israel, as well. Today we need unity not as a means for reestablishing sovereignty over a piece of land; we need it in order to survive! In fact, the whole world needs it in order to survive. If we maintain our hedonistic attitude toward life, we are damning ourselves to Hell on Earth. But if we embrace unity instead, there is plenty for all of us to make our lives Heaven on Earth. Only we, Jews, have the key to this kind of unity, because only we had ever experienced it. In the days of the Maccabees, we were a society based on mutual guarantee that was formed at the foot of Mount Sinai, and that mutual guarantee was reinforced after each feud. Now we must rekindle it and share it with the world. The world will not find it anywhere else until we reawaken it and pass it on. 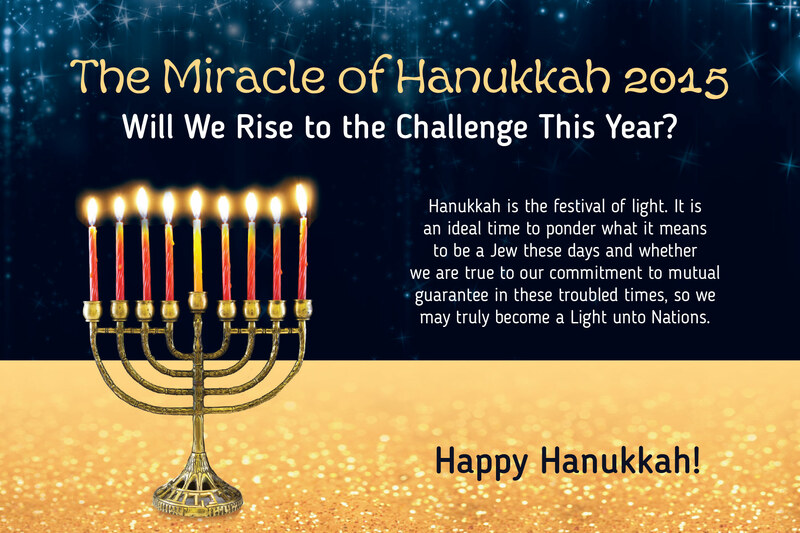 This is what it means to be “a light for the nations,” and no time is better to start giving the light of unity than the Festival of Lights, which is Hanukkah. This year, as the world desperately needs some peace and harmony, may we all unite and share our unity with the entire world.